The Kansas Expocentre recently put in place a new security procedures to ensure the safety of their patrons and employees. The updates to the Expocentre’s security policies went in to place just last week. They have begun banning items which were not previously on the list such as backpacks and cameras with lenses that can be removed. An updated entrance security policy puts guests through metal detection using a wand and bag checks. Any prohibited items found are subject to confiscation by the Expocentre and are to either be returned to the guest’s car or thrown away. The additional security which has been employed is making it more difficult to get into the venue in a timely manner. This has caused frustration with some patrons and there is concern it may effect attendance. However, the steps being taken are not out of the ordinary for an event center of their size and many other venues in the region have also implemented additional security. Expocentre officials feel the extra time is worth it to make sure not only attendees but also coaches, players, bands and employees feel safe and comfortable while using their facility. Signs have been displayed outside the entrances listing items which are not allowed to be brought in. The Expocenter’s made statements on their social media accounts about the new policy changes and thanking everyone for their cooperation. 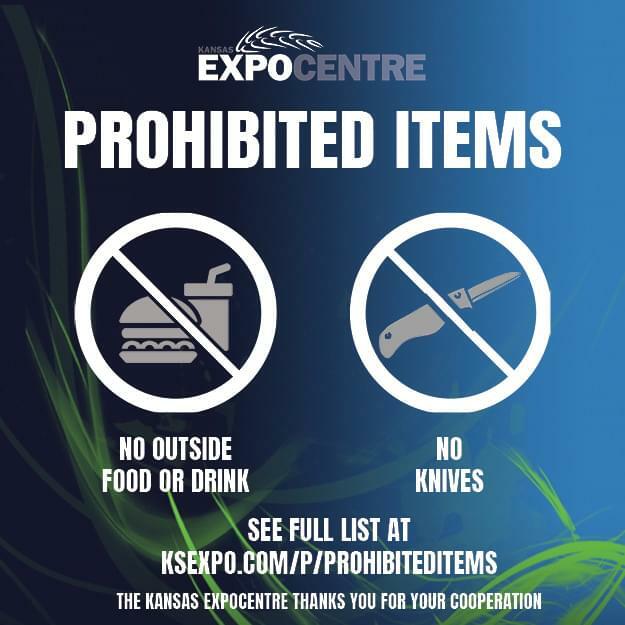 The new rules apply to all events held at the Kansas Expocentre and you can find a full list of banned items on the Expocentre’s website.